Tory McRains thinks learning how to be a good Musimagia and following their rules would keep her out of trouble. 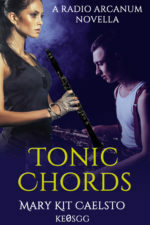 She agrees to teach Alamar how to play the saxophone as a way to atone for her sin of accidentally wiping his mind, and his ability to play music. A local homeless man, Diego, reveals that he’s a Mad Bard, which leaves Tory wondering if she has yet one more group of musical magic wielders to worry about, and when the giant anaconda guardian of her rainforest, whom local folklore calls Mother, reveals herself, well Tory realizes she’s in deeper than she ever imagined. Add in increasing magical attacks, the fact that Alamar isn’t living in a hostel like she thought, and the fact that the danger stalking the rain forest is now coming from within the Musimagia organization. Tory knows one thing. She’s sick and tired of getting cryptic messages from those who wish to use her power as her own. It’s time for her to take a stand, not just for her own life also but for the future of her rainforest home and those closest to her.